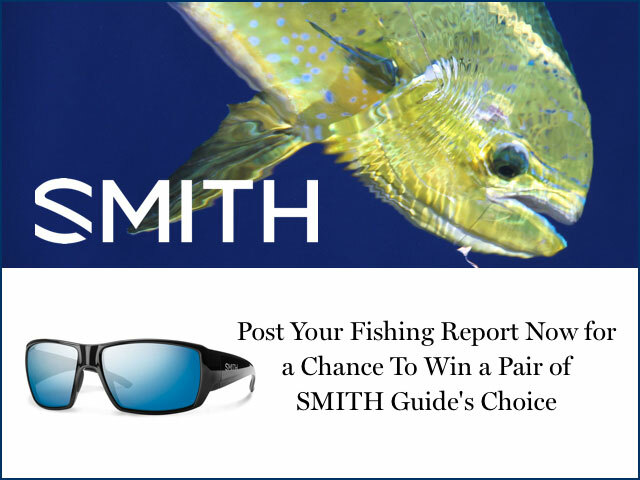 Submit your latest fishing report to win a pair of Smith sunglasses.. Enter your best reports today for a chance to win a pair of Smith sunglasses! FishTrack editors will choose a new winner every month in 2016. Post a report now to enter! Share your best fishing reports today for a chance to win big! Starting on February 24, all anglers who post a fishing report on FishTrack.com will be automatically entered into a monthly contest for a chance to win a pair of polarized sunglasses from Smith Optics. Each month the editors of FishTrack will pick their favorite fishing report and hook up the angler who posted the report with a pair of Smith sunglasses valued up to $220. Reports will be judged by the quality of the information shared and the photos posted. Posting a fishing report is super simple and only takes a few minutes. Go to the Fishing Report section of FishTrack and click the ‘Submit Report Now’ button. From here you will be prompted to post a title, brief description, location and up to 14 photos. There is also a field to include a website address. This is great way for charter captains, tackle shops and fishing clubs to promote their page. Feel free to post as many reports as you’d like. To submit a report you must be a registered free user or premium member. The prizes include three different styles from Smith Optics, including the Guide’s Choice, Outlier XL and Dockside. Smith Optics sunglasses feature the latest in polarized lenses including ChromaPop technology for unmatched clarity and enhanced color when fishing, perfect for spotting tailing fish on the horizon. Enter your reports now at fishtrack.com/fishing-reports. 1. Eligibility: NO PURCHASE NECESSARY TO ENTER OR WIN. The Promotion is open to all legal residents of the fifty (50) United States and the District of Columbia, who are 18 years of age or older and of the age of majority in their state of residence as of January 1, 2016. Employees, officers and directors of Sponsors, their parents, subsidiaries, and affiliated companies, advertising, promotion, or production agencies, web masters/suppliers and their IRS dependents and immediate family members (spouse, parents, children, siblings) and individuals residing in their same household, (whether or not related) are not eligible to participate. By entering the Promotion, entrants fully and unconditionally agree to be bound by these Official Rules. Void where prohibited, taxed or restricted by law. All federal, state, provincial and local laws and regulations apply. 2. Timing: The FishTrack / SMITH - (the “Promotion”) begins at 8:01 am PT on February 24th, 2016 and ends at 8:59:59 am PT on December 30th, 2016 (the “Promotion Period”). Prizes will be distributed each month to the person who submits the monthly winning Fishing Report. Winners will be determined by FishTrack staff. 3. How to Enter: Visit the FishTrack Fishing Report page at http://www.fishtrack.com/fishing-reports/ and follow the instructions to submit a fishing report. All entrants must be a registered visitor or FishTrack premium member to submit a fishing report. There is no limit to the number of fishing reports each entrant can post. Entries must be received and recorded by Sponsors’ computer by 9:59:59 a.m. PT on the last day of the month to be eligible. Entries submitted between February 24 and February 29 will be included with March entries. Sponsors’ computer is the official timekeeping device for this Promotion. No automated entry devices and/or programs permitted. All entries become the sole and exclusive property of the Sponsors and receipt of entries will not be acknowledged or returned. The name of the person submitting a Promotion entry must be the authorized account holder of the email address or mobile telephone number used to enter the Promotion, or, entry may be deemed void in Sponsors’ sole discretion. In the event of a dispute over the identity of a potential winner, the entry will be declared made by the authorized account holder of the email address or mobile telephone number submitted at the time of entry, and any potential winner may be required to provide identification sufficient to show that he/she is the authorized account holder of the email address or mobile telephone number. Potential winners may be required to show proof of being the authorized account holder. Submissions will be reviewed for compliance with these Official Rules. 4. Winner Notification/Odds: Potential Grand Prize winner will be selected by FishTrack staff on or about the First of each month, from all eligible entries received during the Promotion Period. Winner notification will be on or about First of each month. Odds of winning depend on the number of eligible entries received during the Promotion Period. Potential prize winner will be notified by phone and/or e-mail at Sponsors’ sole discretion. If potential prize winner cannot be reached after a reasonable effort has been made during the ten (10) days from the first notification attempt, such person may be disqualified, with an alternate prize winner selected in accordance with these Official Rules. Only two attempts for new alternates per prize will be conducted. If attempts fail, unclaimed prize will not be awarded. 5. PRIZES: The Winner (hereinafter defined) will receive (1) pair of SMITH Optics sunglasses (either Guide’s Choice, Dockside or Outlier XL) valued from $169-$219. Prize is non-transferable and no substitution will be made except as provided herein at the Sponsor’s sole discretion. Winners are responsible for all taxes and fees associated with prize receipt and/or use. Expenses not stated are solely the winner's responsibility. If a winner cannot accept prize in accordance with these Official Rules, prize will be forfeited in its entirety and an alternate winner may be chosen. Actual value may vary based on price fluctuations. Prizes are non-transferable and no substitution will be made except as provided herein at the Sponsors’ sole discretion. Sponsors reserve the right to substitute the prize (or a component thereof) for one of equal or greater value if the designated prize should become unavailable for any reason. All federal, state, local and other tax obligations arising from this Promotion, including, without limitation, winning a prize, will be the sole responsibility of the prize winner. 6. AFFIDAVIT OF ELIGIBILITY/LIABILITY RELEASE AND PUBLICITY RELEASE: If a prize notification or a prize is returned as non-deliverable, or if a prize winner is found not to be eligible or not in compliance with these Official Rules, may result in disqualification with an alternate prize winner selected in accordance with these Official Rules. 7. Release: By receipt of any prize, winner agrees to release and hold harmless Sponsors, their respective subsidiaries, affiliates, suppliers, distributors, advertising/promotion agencies, and prize suppliers, and each of their respective parent companies and each such company’s officers, directors, employees and agents (collectively, the “Released Parties”) from and against any claim or cause of action, including, but not limited to, personal injury, death, or damage to or loss of property, arising out of participation in the Promotion or receipt or use or misuse of any prize. 8. PUBLICITY RELEASE: Except where prohibited, acceptance of a prize constitutes winner’s consent that their name, likeness, voice and/or biographical data may be used in any medium for advertising and promotional purposes without limitation and without additional notice, compensation or consent. 9. GENERAL: All federal, state and local rules and regulations apply. By receipt of any prize, winners agree to the use of their name, likeness, and biographical information for purposes of advertising, trade or promotion without further notice or compensation except where prohibited by law. By participating in the Promotion, or by accepting a prize, all participants agree to release, indemnify, and hold harmless the Released Parties for any and all liability, for loss, harm, damage, injury, cost or expense whatsoever, including, without limitation, property damage, personal injury and/or death which may occur in connection with, preparation for, travel to, or participation in the Promotion, or possession, acceptance, and or use or misuse of any prize or participation in any Promotion-related activity and claims based on publicity rights, copyright infringement, trademark infringement, intellectual property rights, defamation or invasion of privacy and merchandise delivery. 10. LIABILITY LIMITATIONS: The Released Parties are not responsible for lost, late, misdirected, incomplete, or non-delivered entries or e-mail; or for interrupted or unavailable satellite, network, server, Internet Service Provider (ISP), Website, telephone or other connections, availability or accessibility, or miscommunications, or failed computer, satellite, telephone or cable transmissions, or lines, or technical failure or jumbled, corrupted, scrambled, delayed, or misdirected transmissions or computer hardware or software malfunctions, failures, or technical errors or difficulties, or other errors of any kind whether human, mechanical, electronic or network or the incorrect or inaccurate capture of entry or other information or the failure to capture, or loss of, any such information. Persons who tamper with or abuse any aspect of this Promotion or otherwise attempt to undermine the legitimate operation of the Promotion by cheating, hacking, deception, or other unfair playing practices or intending to annoy, abuse, threaten or harass any other participants or Sponsors’ representatives, as solely determined by the Sponsors, will be disqualified. Any use of robotic, automatic, macro, programmed or like entry methods will void all such entries by such methods, and disqualify any participant using such methods. The Released Parties are not responsible for injury or damage to participants' or to any other person's computer related to or resulting from participating in this Promotion or downloading materials from or use of the Website. Should any portion of the Promotion be, in Sponsors’ sole opinion, compromised by virus, worms, bugs, non-authorized human intervention, technical failures or other causes which, in the sole opinion of the Sponsors, corrupt or impair the administration, security, fairness or proper play, or submission of entries, Sponsors reserves the right at its sole discretion to suspend, modify or terminate the Promotion, and select the winners from entries received prior to action taken or as otherwise deemed fair and appropriate by Sponsors. The Released Parties are not responsible for any incorrect or inaccurate information, whether caused by Website users, tampering, hacking, or by any equipment or programming associated with or utilized in the Promotion, and assume no responsibility for any error, interruption, deletion, defect, delay in operation, or transmission, communications line failure, theft or destruction, or unauthorized use of this Website. Choice of Law and Dispute Resolution – This Promotion is governed by the laws of the United States and the State of California applicable to contracts made and performed in the State of California, without respect to conflict of law doctrines. As a condition of participating in this Promotion, participants agree that: (1) any and all disputes, claims and causes of action arising out of or connected with this Promotion or any prize awarded shall be resolved individually, without resort to any form of class action, exclusively before a court located in the State of California having jurisdiction and Participants irrevocably consent to the Jurisdiction of the courts located in the State of California; and (2) UNDER NO CIRCUMSTANCES WILL PARTICIPANT BE PERMITTED TO OBTAIN AWARDS FOR, AND PARTICIPANT HEREBY WAIVES ALL RIGHTS TO CLAIM, INDIRECT, PUNITIVE, INCIDENTAL AND CONSEQUENTIAL DAMAGES AND ANY OTHER DAMAGES, OTHER THAN FOR ACTUAL OUT-OF-POCKET EXPENSES, AND ANY AND ALL RIGHTS TO HAVE DAMAGES MULTIPLIED OR OTHERWISE INCREASED. SPONSORS’ TOTAL CUMULATIVE LIABILITY IN CONNECTION WITH THIS PROMOTION, WHETHER IN CONTRACT OR TORT OR ANY OTHER LEGAL THEORY, SHALL NOT EXCEED THE STATED ARV OF THE PRIZES OFFERED HEREUNDER. In the event any provision of these Official Rules will be held to be unenforceable, these Official Rules will continue in full force and effect without such provision. These Official Rules are intended to be the complete, final and exclusive statement of the terms of the agreement between each Participant and the Sponsors relating to the subject matter hereof. 11. Use of Data: Sponsors will be collecting personal data about participants online, in accordance with their privacy policies. Please review the Sponsors’ privacy policies at http://www.surfline.com/privacy.cfm. By participating in the Promotion, entrants hereby agree to Sponsors’ collection and usage of their personal information for use in administering the Promotion and acknowledge that they have read and accepted Sponsors’ privacy policies. Unless the entrant otherwise expressly agrees, his/her personal information shall be used only for the purposes of administering the Promotion. 12. Winner: On or about March 1st, 2016 you may obtain the name of the prize winners, by mailing a self-addressed, stamped envelope to: FishTrack x SMITH Optics, c/o Surfline/Wavetrak, Inc., 300 Pacific Coast Highway, Suite 310, Huntington Beach, CA 92648. Requests received after December 15, 2016 will not be honored. 13. Sponsors: This Promotion is Co-Sponsored by: Surfline/Wavetrak, Inc., 300 Pacific Coast Highway, Suite 310, Huntington Beach, CA 92648, and SMITH Optics, 409 N. Main, Hailey, ID 83333.